Improv is completely unscripted, and depends on incorporating suggestions from the audience into a scene. So that’s what the IPP does, but we add puppets into the mix. We start with a set of questions (What is something you would miss if there was an apocalypse? What’s a location that would fit on this stage? What is your favorite activity?) and use that to inspire a story, acted out with puppets. Although people can act characters in the story too. We don’t try to hide the puppeteers – the puppets are so engaging that there’s really no need to hide the puppeteers. I joined as an extra cast member in 2013. Usually we’ve done what is called “long-form” improv, rather than short improv games. At some shows I’ve been involved with, we’ve also played music on tiny instruments (I play a small accordion – not well – mostly for comic effect. The others play ukeleles and a small mandolin), picked out given that month’s theme for the show. We then use those songs to inspire the questions we ask which then inspire the scenes acted out. So, for the 80s show, we played some Twisted Sister, some REM, and some Devo, and then asked questions like “what’s something you’re not going to take anymore?” and “how might the world end?” and “what is something that you might whip?” (“Whip It” is really fun to play on the accordion). The story could go anywhere from there – it might be a story about incompetent and biased news anchors reporting on a tidal wave of sprinkles, which can only be stopped by the protagonist inventing a machine to make enough icecream to stop the sprinkle onslaught. Or anything, depending on what the audience suggests. I’ve been pretty obsessed with puppets ever since I saw The Muppet Show at an early age. 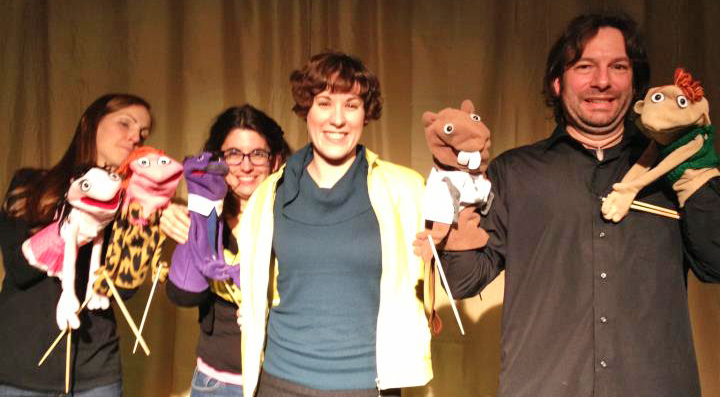 Puppets allow you to get into different characters that might be harder to make clear without costuming or other props, which we don’t have in these improv shows. 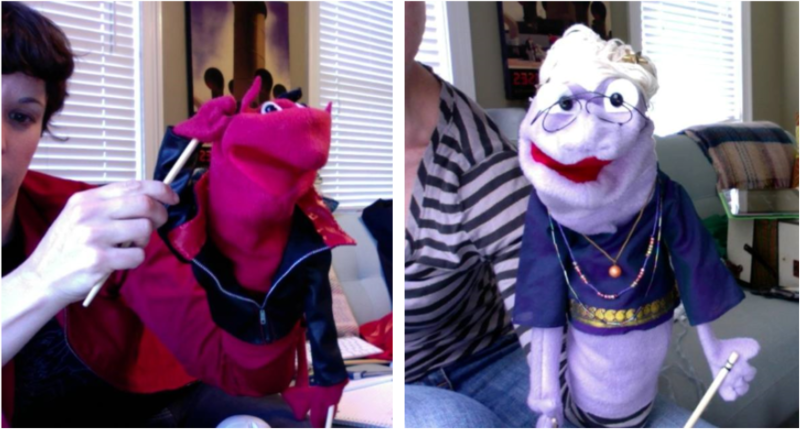 I can be a granny, or a bro, or a serious older man, just by changing which puppet I’m using. It makes it easier to create a world which has more characters than you have cast members, and it’s not confusing for the audience, as it would be if you tried to play more than one character in an improv show without puppets. I got involved with the Improvised Puppet Project because they had auditions for extra cast members for a Post-Apocalyptic Improvised Puppet Zombie Musical. I really only paid attention to the ‘Puppet Zombie Musical’ bit (I also really like singing). I turned up to the auditions, and only then did it dawn on me that I would have to improvise. The Puppet Zombie Musical was part of the fringe festival in Portland, Maine, put on at several places around town. We rehearsed at least weekly, sometimes more often, for quite a few months before the show. You have to learn how to use the puppets, and practice improvising. This show also had the extra layer of having to improvise songs and dancing. It’s not all about what happens on stage. Lauren has not made any puppets of philosophers. If she does we should certainly arrange for a performance at an APA meeting. But she has thought about some of the connections between her hobby and her work as a philosophy professor. I think there is a connection between improv and teaching. Teaching is such a performance, even if you’re lecturing, and improvising has to come in when you’re running discussion centered classes. I usually go into my class with a handout with 4-8 questions about the reading. The students’ questions and comments really determine the direction of the class, so any planning I do is usually out the window after the first 10 minutes. Lauren didn’t have any footage of performances with her in it, but you can get a taste of what the IPP is up to in this video. Thanks to Lauren for taking the time to share her hobby with the rest of us. 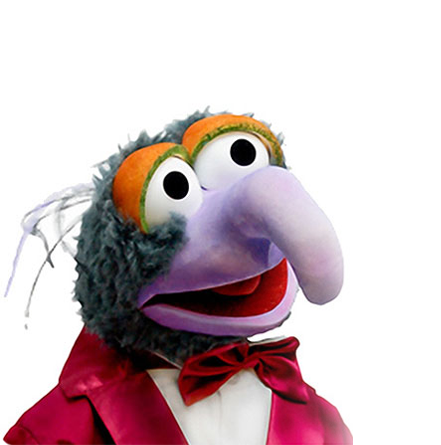 Now if we could only figure out what kind of creature Gonzo is.